So a few years ago I read a young adult book about a female human who crash landed on a planet and meets some aliens who help get her somewhere, but I forget where. The aliens are described as being reptilian, and I think near the beginning a passing reference is made to one of the alien POV character's relatives regrowing a limb. The POV shifts between the human and the aliens, and they have to find ways to communicate across a language barrier. I think, but I'm not sure, that the human protagonist's name was Hannah, but I know the aliens thought it was funny because in their language, her name meant either "twig" or "little twig". I'm pretty sure that the world the story takes place in is heavily forested or thick swampland, or at least the part the human lands in. The atmosphere is breathable to the human protagonist. I'm pretty sure the story starts from the POV of the aliens, and that they are harvesting some sort of plant. I don't think they have a high tech society, I think it was more of a subsistence agriculture kind of thing. I'm pretty sure the aliens help get the human back with the use of a tool the human had, which may or may not have beeped when pointed in the direction of wherever the human was trying to get to. Sorry a lot of the details are so vague, I can't remember a lot of it. 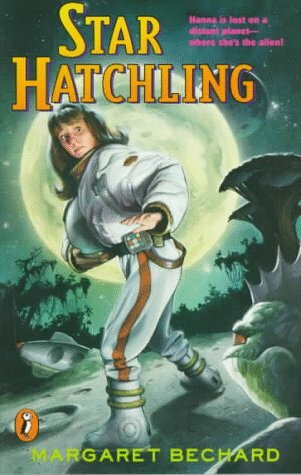 Star Hatchling by Margaret Bechard. The girl is named Hanna, they call her Twig. The aliens are reptilian.